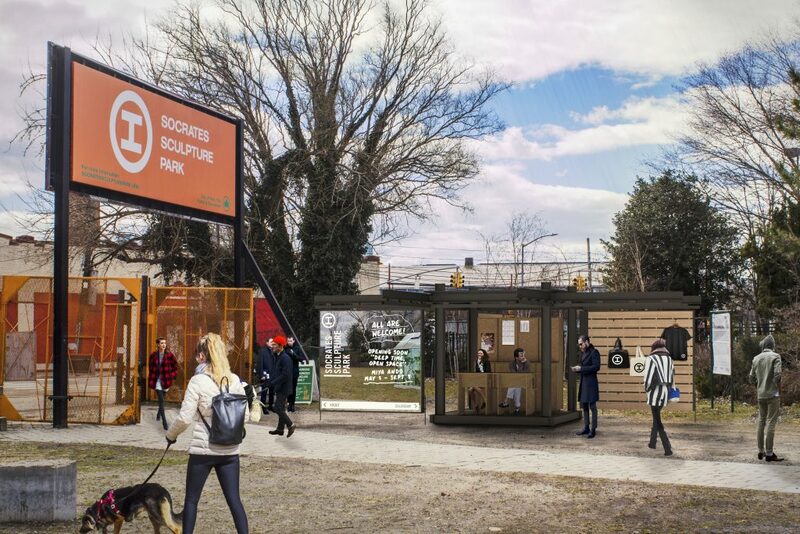 Socrates Sculpture Park and The Architectural League of New York are pleased to announce that Objects In Mirror Are Closer Than They Appear by School Studio is the winning proposal for the seventh annual Folly/Function, a juried design-build competition for architects and designers. Objects In Mirror Are Closer Than They Appear, conceived by Brooklyn-based firm School Studio, is a mirrored cubic kiosk with sliding wall-doors and applied signage. School Studio’s innovative design maintains the functional intent of a kiosk – to impart information – while blending into the landscape creating a paradox of visibility and invisibility. The structure’s mirrored surfaces reflect the sky, landscape, and sculptures, while its steel armature echoes the Park’s industrial roots. Sliding wall extensions reveal the interior and allow for multiple structural configurations. Seen from afar, when the mirrored doors of the kiosk are closed, the structure melts into the scenery. 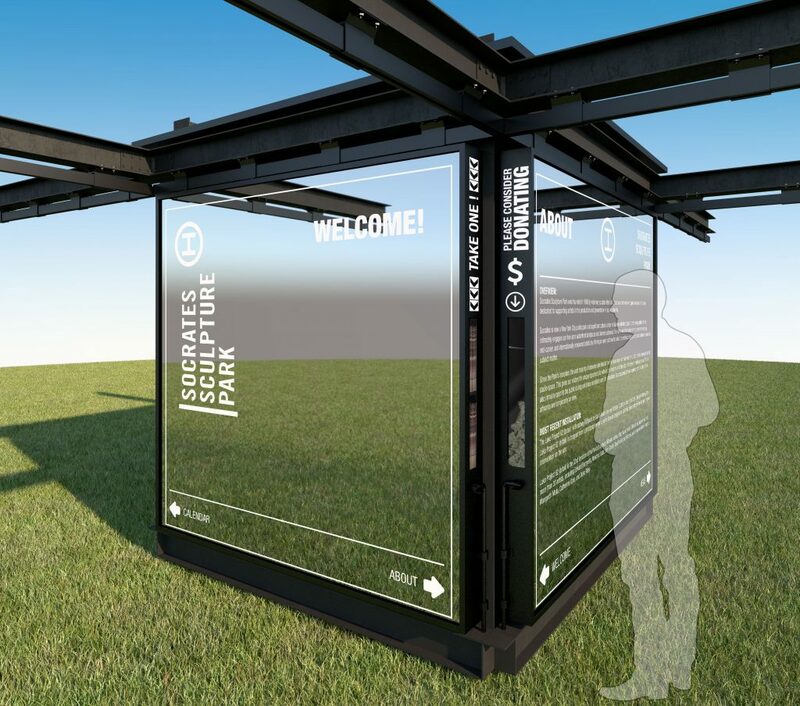 Up close, the kiosk signage is revealed to the viewer, and the mirrored surface allows visitors to view a reflection of themselves and the Park. 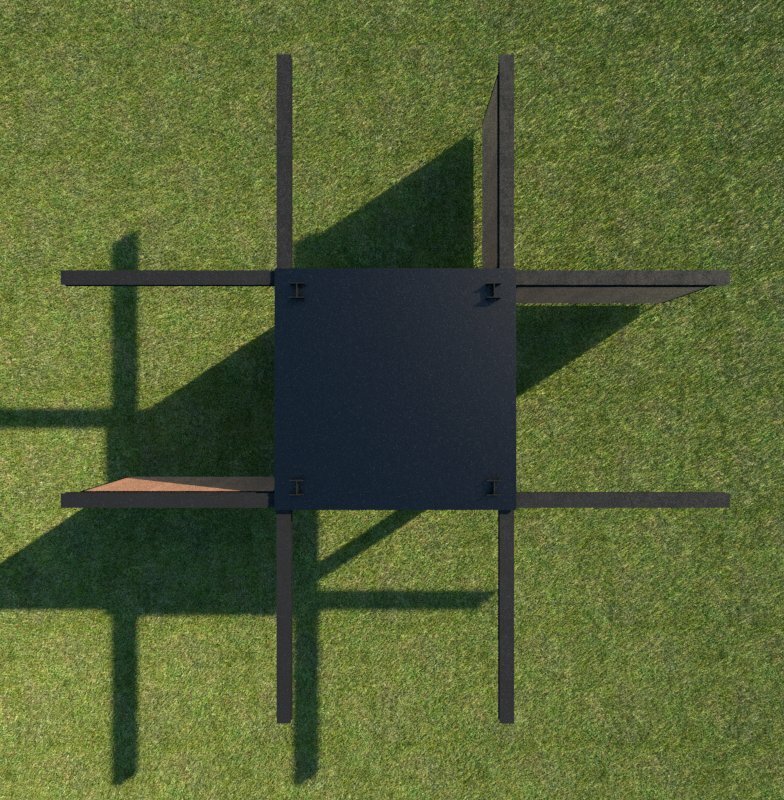 The clarity of the kiosk’s exposed I-beam frame contrasts with the illusion of the mirrored surface. The interior of each wall-door features cedar boarding and a flexible hook system to maximize the kiosk’s potential for storage and display. Inside, simple plywood furniture and cabinetry complement the architecture of the structural frame. These details emphasize the materiality of the kiosk’s construction and realize the Park’s aim to highlight the creative process from start to finish. Folly/Function is an annual juried competition challenging architects to design and build a large-scale project for Socrates Sculpture Park’s visitors. Jointly directed by Socrates and The Architectural League of New York, the program addresses the intersection of architecture and sculpture in public space. Folly/Function began in 2012 as “Folly,” inviting architects and designers to explore the conceptual framework of “follies,” temporary structures that intentionally served no utilitarian purpose. By 2016, Folly’s fifth year, the popular program was recast as Folly/Function, a competition that invites entrants to fuse form with utility to design lasting Park infrastructure. The 2019 competition asked entrants to propose innovative solutions for a kiosk to serve as an information and visitor service hub and merchandise sales point. Previous winning proposals include RRRolling Stones by HANNAH (2018), Circle Shade 2πR4 by Eva Jensen Design (2017), Sticks by Hou de Sousa (2016), Torqueing Spheres by IK Studio (2015), SuralArk by Austin+Mergold (2014), tree wood by Toshihiro Oki architect p.c. (2013), and Curtain by Jerome W. Haferd and K. Brandt Knapp (2012). School Studio’s 2019 proposal was selected from 64 international submissions by a jury of leaders in the fields of architecture and design, comprising Andrew Bernheimer, Principal, Bernheimer Architecture; Wendy Evans Joseph, Principal, Studio Joseph; John Hatfield, Executive Director, Socrates Sculpture Park; Toshihiro Oki, Principal, Toshihiro Oki Architect; Stacie Wong, Principal, Gluck+. The program is directed jointly by Jess Wilcox, the Park’s Director of Exhibitions, and Anne Rieselbach, Program Director at The Architectural League of New York. Folly/Function is supported, in part, by public funds from the New York State Council on the Arts with the support of Governor Andrew M. Cuomo and the New York State Legislature, and the New York City Department of Cultural Affairs, in partnership with the City Council. School Studio is a Brooklyn based architecture and design practice led by Kyle Bigart and Kathryn Hoefler. Focusing on human-centered design at every scale, School takes a cross-disciplined collaborative stance on every project through a research and conceptual based approach. The Architectural League nurtures excellence in architecture, design, and urbanism, and stimulates thinking and debate about the critical design and building issues of our time. As a vital, independent forum for architecture and its allied disciplines, the League helps create a more beautiful, vibrant, innovative, and sustainable future. Join the conversation on social media by tagging Socrates Sculpture Park (@SocratesPark), The Architectural League (@ArchLeague) and using the hashtags #FollyFunction, #FollyFunction19, and #KioskAtSocrates.